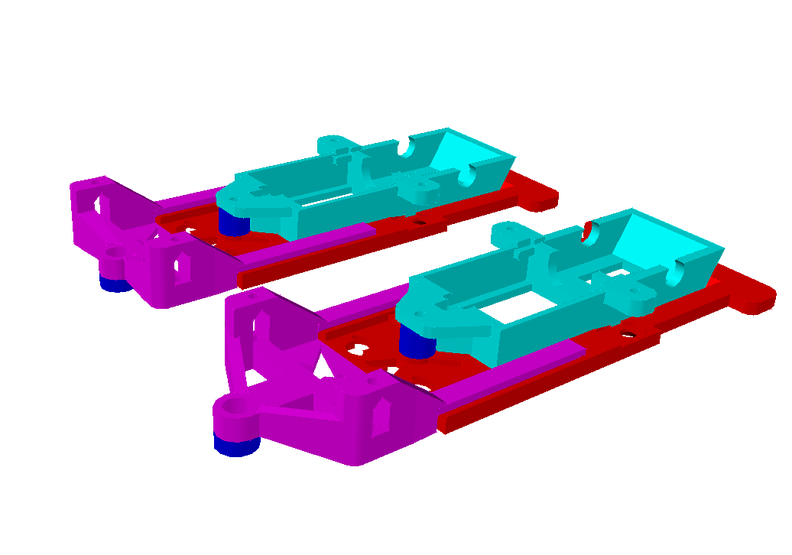 Over the past few months I have potted around designing a "one size fits most" adjustable chassis. This is inline only at the moment. After many iterations I think I have something worthwhile. There are two options short nose (3.61mm) or long nose (12.50mm) front, being length from axle to guide. 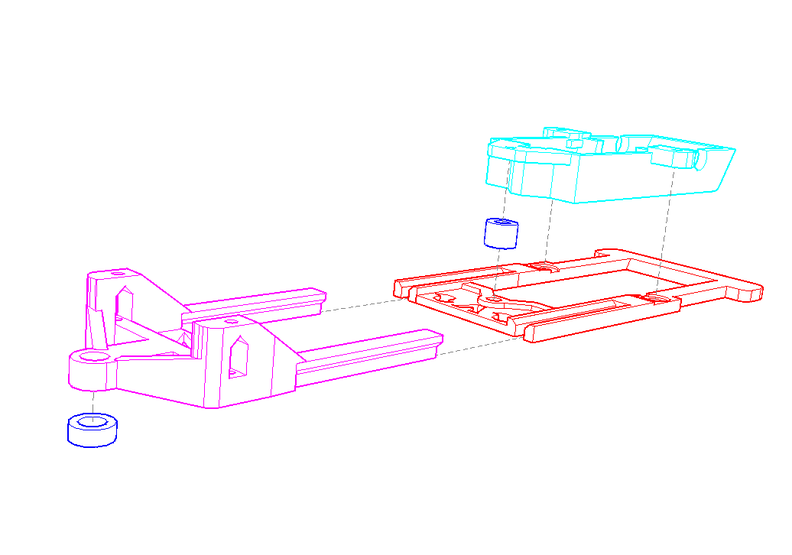 Below is a plan view with basic dimensions, it probably could go longer but I have allowed for about 10mm overlap in the slots. The front slots into the rear and will have to be glued into place. 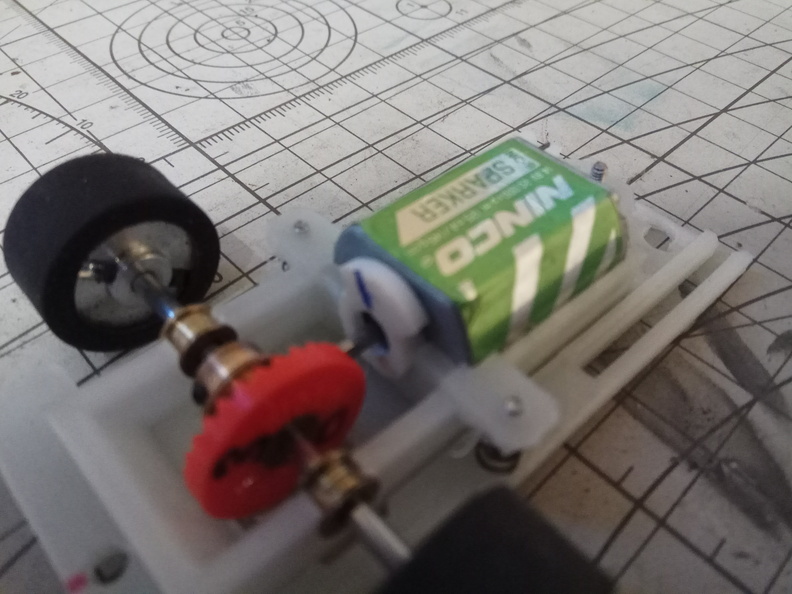 There are multiple spacers for both the motor pod and the guide. 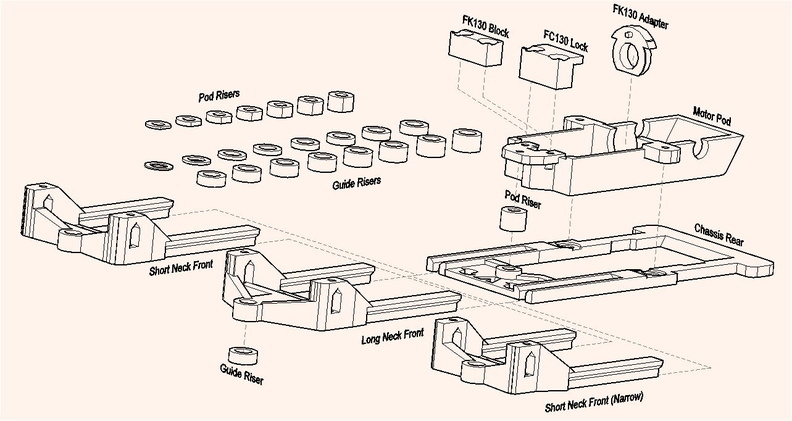 The pod risers are at 0.50mm increments from 0.50mm to 3.5mm. or high (4.5mm o/s) with spring suspension. The pod is adjustable anywhere in between these extremities. The front axle is adjustable with the use of 2mm grub screws. The tail has plenty of room to drill holes for post mounts. 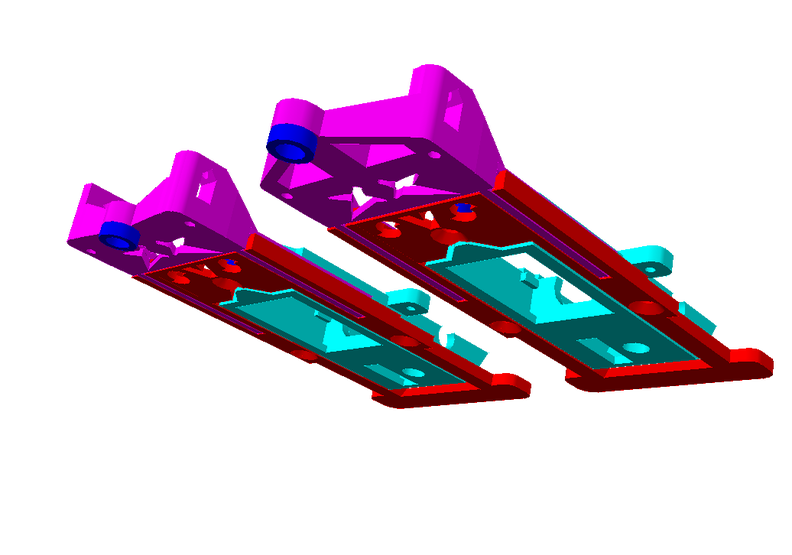 The long nose front has a support suitable to drill for body post in the centre. The short nose is wide enough that the body posts may sit in behind the axle support where the logo is. This is currently untested on the track as mine is down for a while. Any ideas on improvements will be well received as many minds and all that. Edited by ZeGas, 18 August 2017 - 03:49 PM. Will this suit my measurements we have spoke about ?? Should do, goes from 71-92, your two were 73 & 77. Here is the first off the line complete chassis. 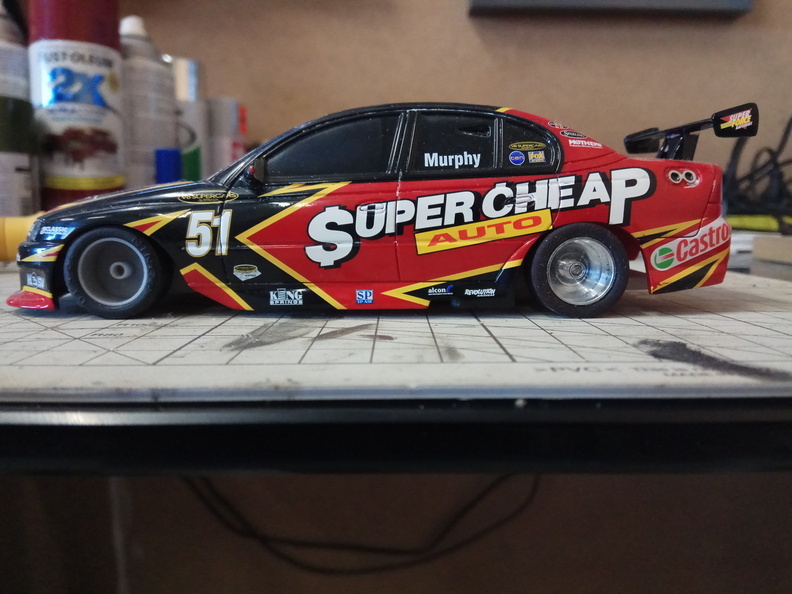 Still need to adjust the ride height etc, but it seems to sit well enough. 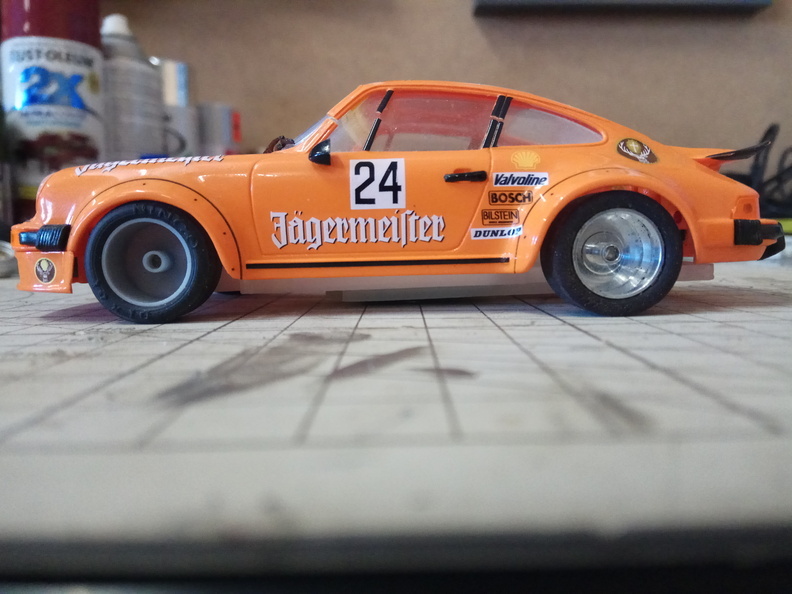 If anyone knows where I can get a new Ninco 934 Jagermeister at a reasonable price It'd be greatly appreciated, mines a bit beat up and they are rare as hens teeth now. 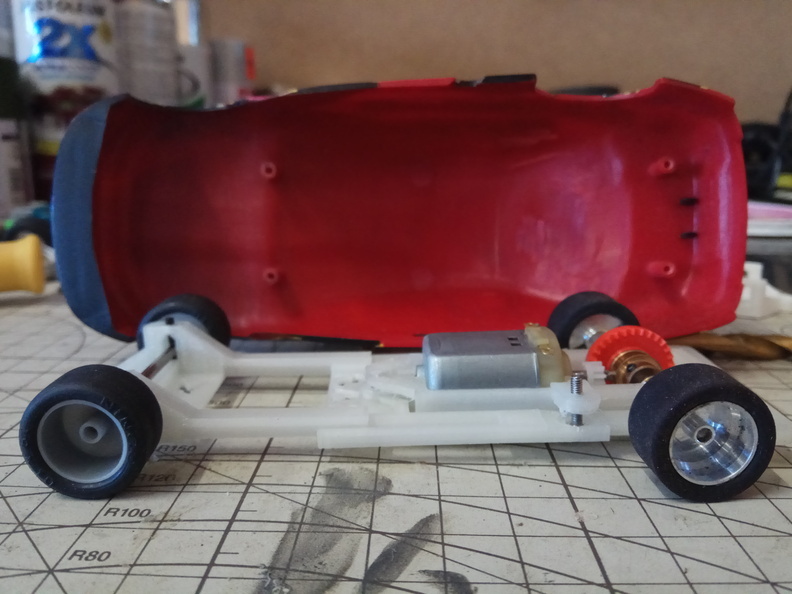 So that is the shortest wheel base I have, and this is the longest, chassis sits well on both. Looks an interesting project. a few questions if you don't mind. Have you got a price yet ? I have already designed an FC130 to FK130 adapter and a slot in the pod is easy enough to do. Unfortunately the FK is a bit wider than the FC and it just split the pod a bit. It would be easy enough to rework for an FK pod so I'll look at doing that soon. I haven't worked out a price yet I'll try an figure something out in the coming days. Happy to trade though as all will be spent on slot car stuff anyway. 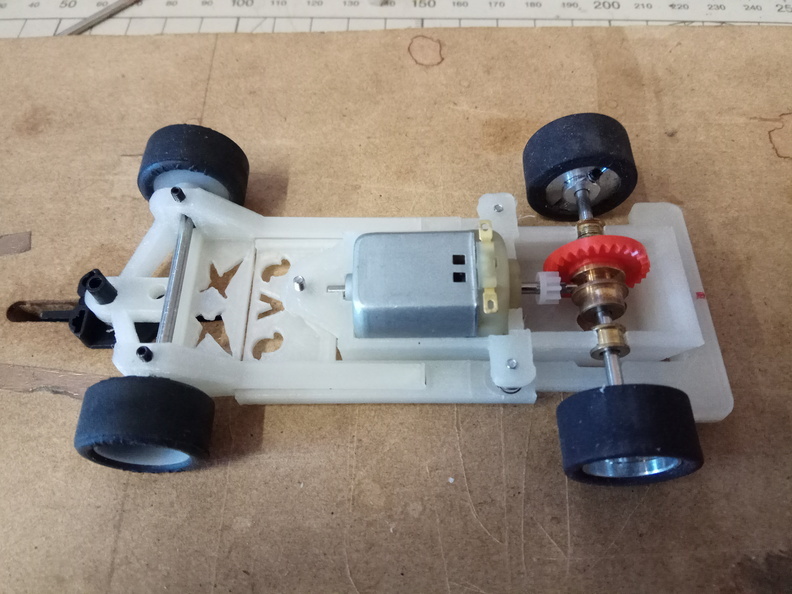 I'm thinking a kit with all bits including chassis, springs, screws and risers etc. I have had a few enquires about purchasing this and have had a think about price. I want to keep the price low as this is a hobby for me as well as others and it is nice to share the love. 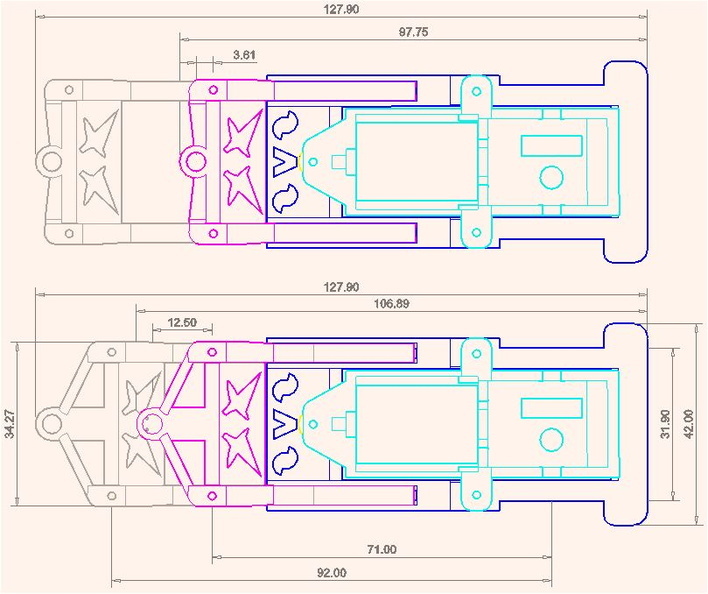 Going off what I have seen on Shapeways for a chassis, they seem to go for about $30au upwards. And the resin boys seem to sell there bodies for around the same. Here is what I am looking at doing as a package. Classic bodies are always welcome. Edited by ZeGas, 18 September 2018 - 01:33 PM. Nice project, thanks for sharing what you are doing. These are very nice and I like your Spy V Spy logo in the chassis. Might work well on some of the kits I have and your price is very cheap. "Spy v Spy", can't be that, wouldn't it breach some kind of copyright. It is Slot Vehicle Systems and the icons are chilli peppers. Thinking of getting rid of the logo and just keeping the SVS as it would give more opportunity for body posts. Hows you mates printer going, got anything good off it yet? Edited by ZeGas, 20 August 2017 - 06:50 PM. Way to go ZeGas, good job! ... Well thought out by the looks. I will try one if available. Just tell me total price including postage to New Plymouth, New Zealand and can I pay via Paypal. Personally I like scratch building or modifying existing chassis. Shapeways and the like tend to be very expensive because of our weak dollar. 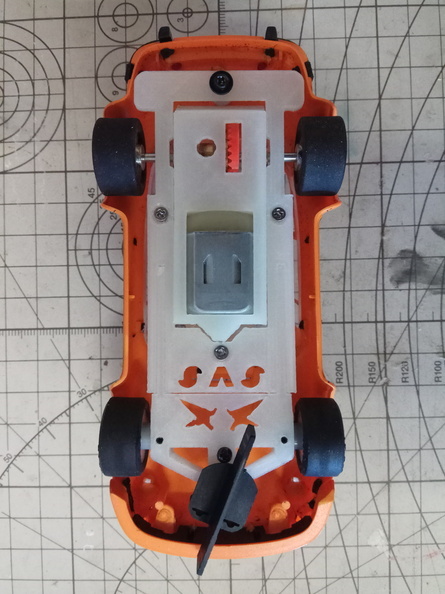 Alternatively the new Scaly cars if you buy the PCR kit add up to more than a Slot-it or NSR. I have used the MRRC Sebring and Slot-it HRS though so interested to compare. I'd be interested to see how it compares myself. I see you supply several front ends. An adjustable guide post might be worthwhile. 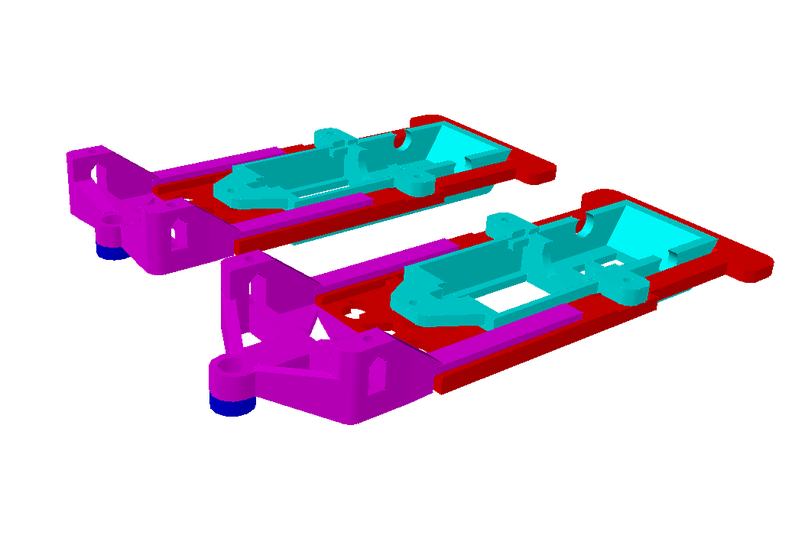 Also different chassis hardness if that is possible with 3D. A slimline pod is also a possibility. I'll put that on the list of things to think about how to suitably achieve. Having driven and admired your Corvette in the IPS- I know this will go well. How are you planning to secure the wheelbase length in a non permanent manner like a HRS2? At the moment Bov they will have to be glued in place as the slots would be dramatically weakened if there were holes in it. To get the holes and grub screws to work the adjustable slots would have to be higher and thicker. Initially I had tried to incorporate holes but gave up due to weakness in the support. 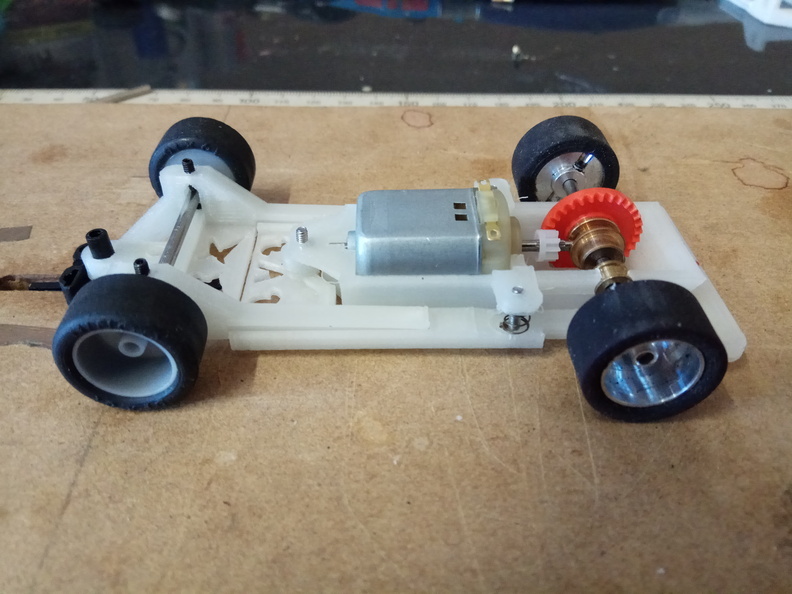 I am guessing if people would generally want the kit for one car only and the glue option allows the perfectionist to get the wheel base just right without compromise as would be the case with holes. 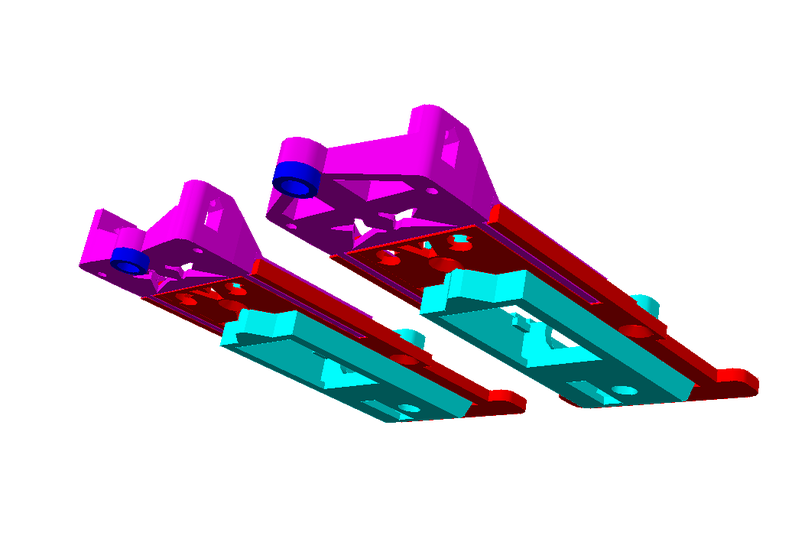 Sorry I just reread your post and noticed an idea about chassis stiffness. 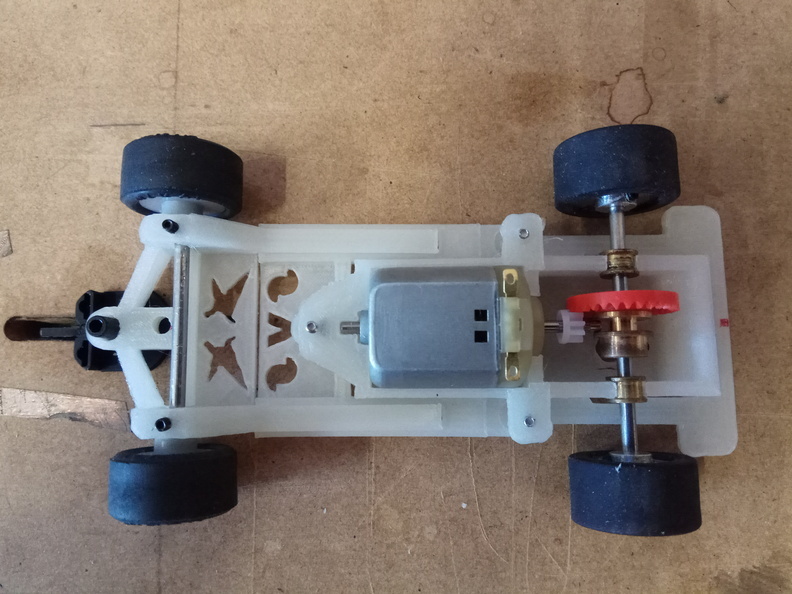 Have a look when you get your kit and see what improvements can be made, at the moment I am offering 3 spring damping options (soft, medium and hard), the hard is really quite hard and would stiffen the pod with the chassis. 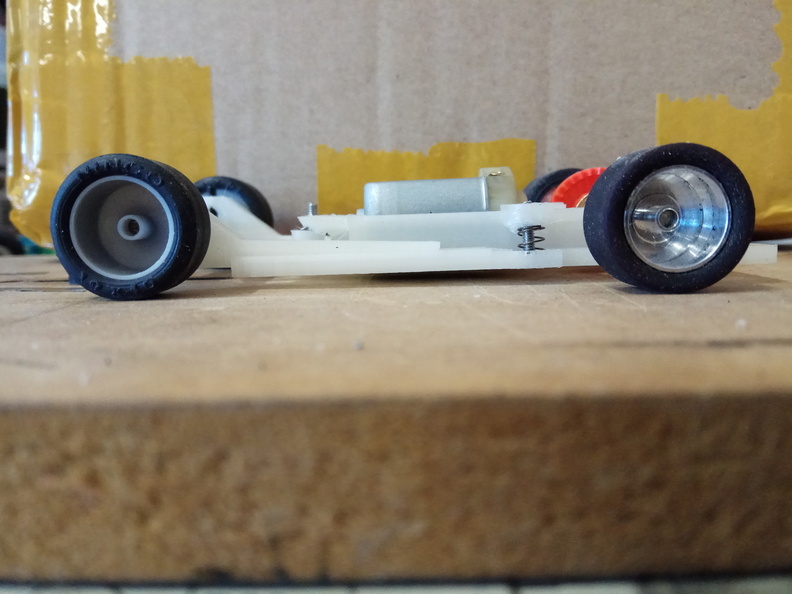 The chassis itself, with front and rear glued, is quite stiff. As for material, I have the choice of PLA or ABS at the moment. 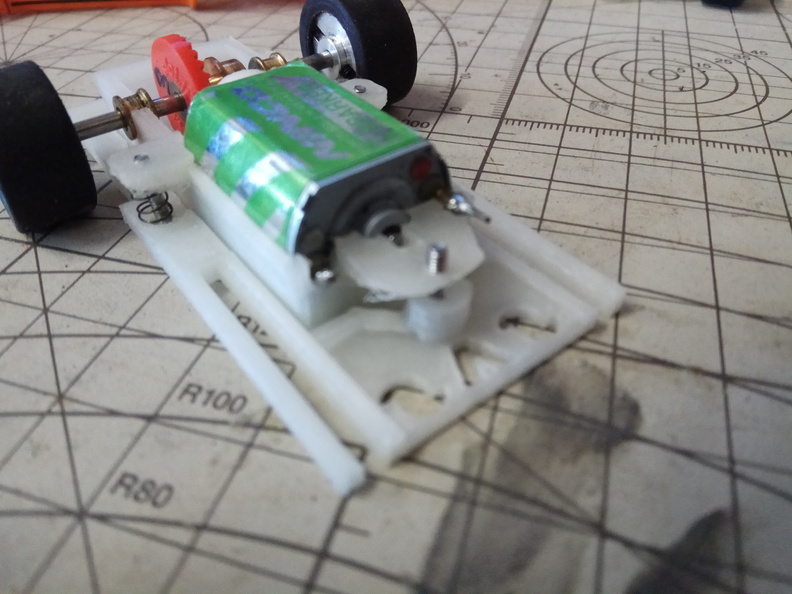 I am currently using the PLA, I haven't tried ABS on a chassis yet as I ran out. PLA is a bit softer that ABS and it also differs between colours for some reason, probably the dyes used. White is very difficult. I have found the Glow Green is the most reliable for consistent prints and offers reasonable flex without splitting. I think this is simply brilliant. however, I would suggest to add an anchor point also at the back of the motor pod so to avoid any side-to-side movement.